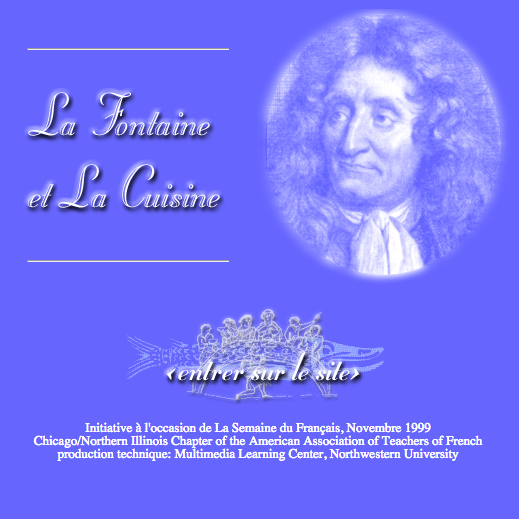 In partnership with the Northern Illinois Chapter of the American Association of Teachers of French (AATF), the Multimedia Learning Center created a fun and captivating web site exploring the fables of Jean de LaFontaine and its potential intersections with fine cuisine. The famous fables of LaFontaine are simply and elegantly presented in both French and English â€“ as translated by the late Northwestern University Professor Norman Spector. Complementing a choice selection of fables is a collection of recipes for foods ranging from Ratatouille niÃ§oise to Petit poussin au laurier. To assist with the use of the materials in secondary education, a number of structured activity plans and game ideas are also provided.